Having got myself started on passenger liner photos in An Evening in the Rocks, I just happened to find the Queen Mary 2 in Adelaide a couple of weeks later. I own a 5 metre runabout style boat so popped it in the water near Outer Harbor (where Adelaide’s passenger terminal is located) to combine an afternoon’s crabbing with a spin over to see the Queen Mary 2. But yet again while photographing the Cunard Queens, the lighting was rubbish with thickish middle level cloud producing a dull, cold and contrastless light. That’s three out of three times I’ve struck these conditions photographing the Cunard Queen liners. Grrrrr… And the crabs weren’t very cooperative on the day either. At least the sea was calm. So, hopefully having not put you off entirely, some images of Queen Mary 2. Queen Mary 2 towering over Adelaide’s underwhelming passenger terminal. 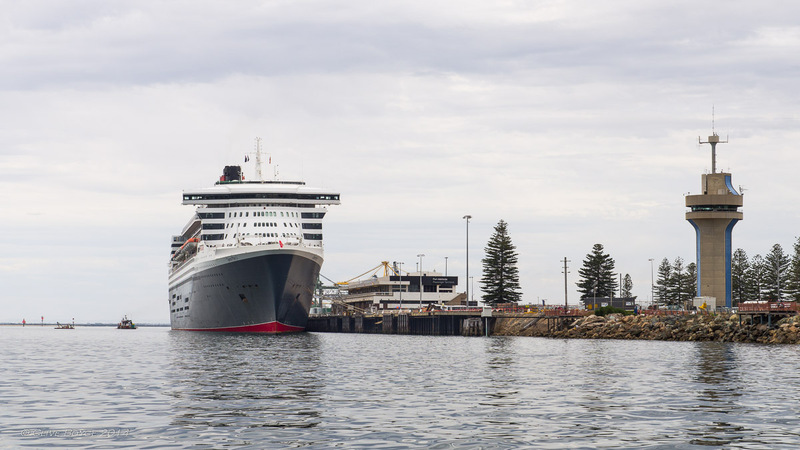 This entry was posted in Adelaide, Australia, Boats and Shipping, Machinery and tagged Outer Harbor, Photography, Port Adelaide, Queen Mary 2, South Australia on June 18, 2014 by aussiesouthlander.